Like any parent, my initial reaction to the autism diagnosis of my son John left me stunned and, for a moment, confused. It was not my first foray with having a special needs child though, as my eldest has Tourette’s. But all the same, the first blow left me breathless. This was an entirely new challenge as autism awareness some 16 years ago was scant. That moment left me overwhelmed! It felt like I was drowning and sadness was also too simple a word when I realized that this is a lifetime disorder, that there is no known cure—or no known cause for that matter. It’s like all my dreams of normalcy for my son nosedived. I was, thankfully, very lucky to have the full support of my family. Having lived so far away from home, my husband was my only pillar of strength. Together, we scoured for treatments and appropriate approaches to understand what autism entails and what we can do to at least alleviate the symptoms. We deduced that we are the best advocates for our child. We talk about anything and everything under the sun. Sometimes, we argue when sorting out conflicting emotions but we made sure to inculcate in our minds that it is autism that has us upset and not each other. Yes, argue if you must but, bear in mind to keep a levelheaded approach to the matter. We also knew that raising a child with autism would require a consistent and supportive environment. To make sure that our child would not regress, we learned special sets of skills and patience, lots of patience, and assurances. We learned certain techniques to better manage his behavior. We learned about home-based ABA programs and other adaptive skills to ensure tapping on the potentials of our son. The keyword is “collaborate.” Effective collaboration within the family and with professionals ensured a much clearer understanding of the characteristics of autism and how this relates to our child’s needs. Looking back, it was also imperative that we got our other kids involved in the process. Small accomplishments can mean a lot to a family struggling to find what is best for one of its members. I find it also important that despite the circumstances, you need to also spend quality time with your other children to make them feel happy and secure. This way, they will be more tolerant of their sibling who is struggling. I also kept a personal journal documenting everything that happened from the moment we were given Johnny’s diagnosis. Each night before bedtime, I would take a few minutes of my time to write the challenges and victories that our son had. Along with it were certain ideas and suggestions gathered from therapists and caregivers as well as from family and other resources. My journals became our family’s sort-of guidebook. This basically was the brainchild behind my book, Living Autism Day by Day. I strongly believe that most often than not, people are much better in expressing their feelings through writing. Remember to not contain yourselves. Reaching out to other autism parents and getting involved in the community as a family comes highly recommended. Your home needs a lifeline as it cannot face the challenges of autism alone, more so when your child is just diagnosed recently. You would need the empowerment of families who understand the day-to-day challenges of autism—and you can contribute to theirs, too. It is a proactive approach and has been proven effective time and again. In all these, however, be reminded to have the support and supervision of mental health professional. With John, we have a reliable developmental psychologist to aid us in our concerns as well as in monitoring his progress. Best of all, always make sure that your child with autism basks in your unwavering love and support. 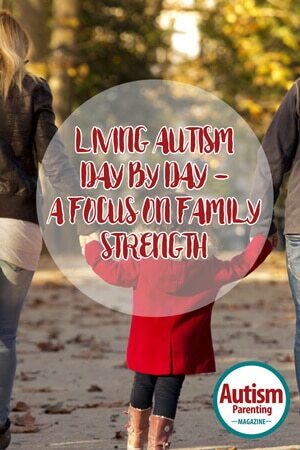 Pamela Bryson-Weaver is the author of Living Autism Day by Day: Daily Reflections and Strategies to Give You Hope and Courage, a multi-awarded and bestselling book on Amazon. A staunch advocate for autism, she is also the mind behind the powerful website—www.livingautismnow.com—an online portal for parents, caregivers, individuals with ASD, service providers, and experts to interact with each other, to raise awareness, and locate the best possible services for them. Bryson-Weaver is uniquely qualified to speak on Autism as she is the past president of the Autism Society in New Brunswick, and has promoted a resolution on autism that was presented locally, provincially and nationally, and was passed nationally in Canada in 2004. To date, all children diagnosed with Autism Spectrum Disorder in her province receive $20k per year for treatment. Married with 3 children, the main driving force in this advocacy is her youngest son, John, who has autism. I found the commonality of us both having one older child with TS and a younger one on the spectrum really interesting. Just when you feel like you are all alone in your circumstances, along comes someone who reminds you how “common and boring” you really are! 😉 Great article!